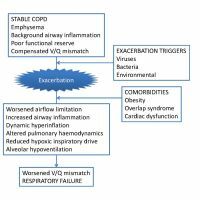 How do COPD comorbidities affect ICU outcomes? Does the duration of smoking cessation have an impact on hospital admission and health-related quality of life amongst COPD patients? Biomarkers in chronic obstructive pulmonary disease: confusing or useful? Anemia and health performance score evaluation as decisive factors for noninvasive mechanical ventilation decisions in AECOPD: are there new key cornerstones?